I wouldn’t say I was one for the stereotypical ‘chick-flick’ (urgently needs rebranding, but separate issue) – in that Love Actually, though an annual Christmas necessity, any other time of the year I cannot bear. 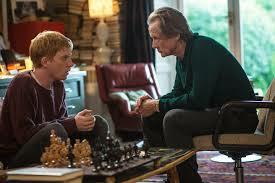 However, also directed by renowned Richard Curtis, About Time I found completely compelling viewing. Perhaps for my complete admiration of the cast (Domhnall Gleeson and Rachel McAdams, THE perfect match) or, more likely for its – I think – killer take on the over-established theme of time travel. I watched it a little too early on an 8-hour flight and having more than a few tears in my eyes was watched cautiously by a bemused passenger across the aisle. Having thought this was the safe option (after watching Filth on the outward flight… not great next to a 10 year old?!) I was proved wrong. About Time features the highs and lows that protagonist Tim (Gleeson) finds himself amongst, after his father (Bill Nighy) admits that he has the ability to time travel. The disbelief of Tim at his new-found talent, and the limits of it – he cannot change history – make this film all the better, as it comes across as far more realistic a prospect. Tim immediately knows how he will use his ability – to find love. The film is quite simply the journey he goes on, literally – from Cornwall to London, and metaphorically – learning to appreciate and not abuse time travel. When Tim learns he cannot travel past the birth of his own children, without changing the outcome, his view of his gift changes entirely. Although this film is primarily based upon the romance between Tim and his future girlfriend Mary, my favourite relationships in it are the ones between Tim and his own family. His absolute admiration for his younger sister, Kit-Kat, and for his Dad, are genuinely moving, as are the lengths he goes to to improve each of their lives. His infatuation with Mary has the audience wincing, waiting for something to go wrong after the numerous proposals, certain she will realise his power, or that it will disappear at the most excruciating moment. True to form though, Curtis doesn’t do romance half-heartedly and by the time the credits are rolling you are left feeling relieved if a little drained from the various emotions. The juxtaposed settings of the film also add to its strength, the idealistic white-washed lodge in ever-sunny Cornwall, in comparison to the rainy capital. However, in review there are definite issues with the film, my main one being: WHY CAN’T THE WOMEN TIME TRAVEL TOO!? This infuriates me as it is all to frequent in films (The Time Traveller’s Wife, as well as no female doctor in Doctor Who). It also makes a mockery of stalking, although Tim does it with the best of purposes; the woman – yet again, has no consent or even awareness of it, meaning she is manipulated. The one subject which I think was portrayed on an okay level, in terms of the minimal depth a Curtis film tends to have, was domestic violence. The vulnerable younger sister is widely supported by her family and they do all they can to get the man out of her life. Although, obviously in reality this is not always the case, it is good that there are some films out there showing how supportive families cope, rather than just the victim. It is clear there are issues with this film and though it does not pretend to be politically correct, the normalisation of these views in a Hollywood movie, make them all that much harder to eradicate in real life. However, if not taken with too much sincerity and analysis, it is an up-beat, live-in-the-moment kind of movie which is sometimes just what you need. Plus with long conversations between Gleeson and Nighy you can’t really say no.